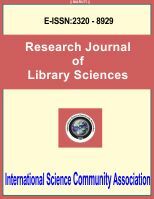 International Science Community Association are publishing an international peer reviewed journal Research Journal of Library Sciences. It is the vision of International Science Community Association to publish research papers, research articles, review papers, mini review, case study and short commutations in all areas of human study without financial restriction. Coverage Area: Researches in the field of Research Journal of Library Sciences including principles, digital library, autonomous library, library science and technology, economy information for library, communication system and recent innovation in libraries, librarianship, development of E-library, planning and networking systems in libraries, networking concept of universities/college libraries, social media and public library networking, new development for academic research libraries, student researcher and faculty behaviour in library, highlighting major findings and suggestions and books management systems for library, etc.